A leader in the manufacturing industry since last 25 years was looking for a way to get reports based on multiple sources of data that was yielding inconsistent reporting between marketing and sales reports. Softweb Solutions suggested this solution to help the client in becoming more agile and customer focused. 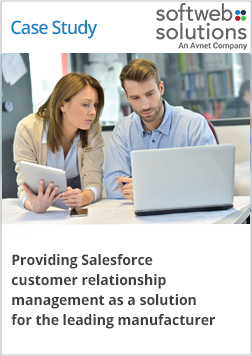 The integrated CRM solution based on cloud supports them for customer engagement, partner relationship management, field services technology, the configuration of price quote automation and improved demand forecasting. With some unique CRM features, the client gets the multiple advantages from the same platform. Satisfying customer needs and demands. Support and enhance quality management practices. Track and manage inventory systems.